Today I want to talk to you about cranking out some work for 90 minutes and regaining your focus. Well, lately what has been resonating with people is my new catchphrase, GSD. Or “Get Sh** Done.” I am working like a madman to try and really dial in my efforts and get stuff done. It feels often like herding cats. Let’s “Get Sh** Done.” Who’s with me? Team GSD. How do we get stuff done? Hey, I get it. It is hard to get things done. there is so much to do. I have a paper list in front of me right now that has about 20 items I am going to try and complete by the end of the day. People often ask me how I can get so much done. Well it is actually quite simple. Focus. Laser-beam focus. But how? It is easy to get caught up in the mantra of “I’m too busy” and jump from task to task. What you need to do is get rid of ALL the distractions. Something that happened to me recently is that my computer crashed. I got that blue screen of death. Luckily I had everything backed up and it loaded up no problem. But I was lucky because all of the tabs, documents, spreadsheets, and other “stuff” was no longer on my screen. I took it as a sign to not have all that stuff open. So I only went after the task I needed to get to. That was it. And if you think you are doing just fine with so much going on, you’re wrong. Read my post on how multitasking is a myth if you want to see how you are really wasting your time. It’s crazy! Set a timer for 90 minutes. Do it. Can you imagine not doing ANYTHING else for 90 minutes straight? Does the thought of a singular activity make you cringe? If you find yourself getting too busy, then it is time to get focused, man! Pick ONE thing and go after it with intensity for 90 minutes. No distractions, no “oh maybe I need a glass of water” or “I should answer this call/email.” Shut it all down and get laser-beamed in. At first, this can be uncomfortable, right? What if someone is trying to get ahold of you? Perhaps a boss, important client, a loved one? Oh no! Unless you are specifically waiting for something, the world can live without you for 90 minutes. And you owe it to yourself. Once you get into the habit of getting in the zone of work, you will find that time flies. And you actually get MORE time in your day. When you complete your 90 minutes, take a break. But not a cell phone break, or a work break, I mean a REAL break. Go for a walk or exercise, or even lay down. I am a huge fan of celebrating small victories, and a 90 minute, focused effort is a cause for celebration. Especially if you have a hard time focusing, like me! See how many short bursts you can do throughout the week where you just rock out a small project. You will find you start to really switch gears mentally and start to complete things much faster. I know that when I first started blogging, it seemed to take forever to write a post, because I was too distracted. It felt like I had taken on too much new work with my blog. The more I focused my efforts in a singular fashion (with practice), the faster I was able to put together content. This post, for example, took me 20 minutes from idea to posted. 3 months ago, it would have been a two hour, half-focused effort. As you see from my other posts, I try and find ways to enjoy the process, no matter what I do. I have found that by focusing my attention on one task, I really get into it and enjoy it more. This process has also helped me carve out MORE free time and get more done! So as I said, let’s start to get our minds switched over to the “Get Sh** Done” model and have more fun doing it. Boom, post complete. 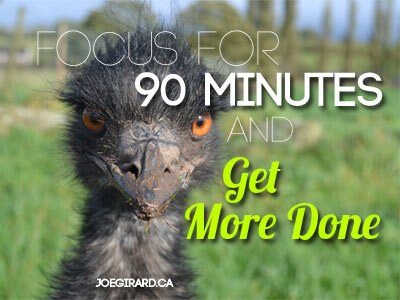 How do YOU get focused and get more done? leave your comments below!